Happy New Year! We hope you had a wonderful Christmas and would like to wish you all a Happy, Healthy and Prosperous 2017! I went with new stash to play the challenge. 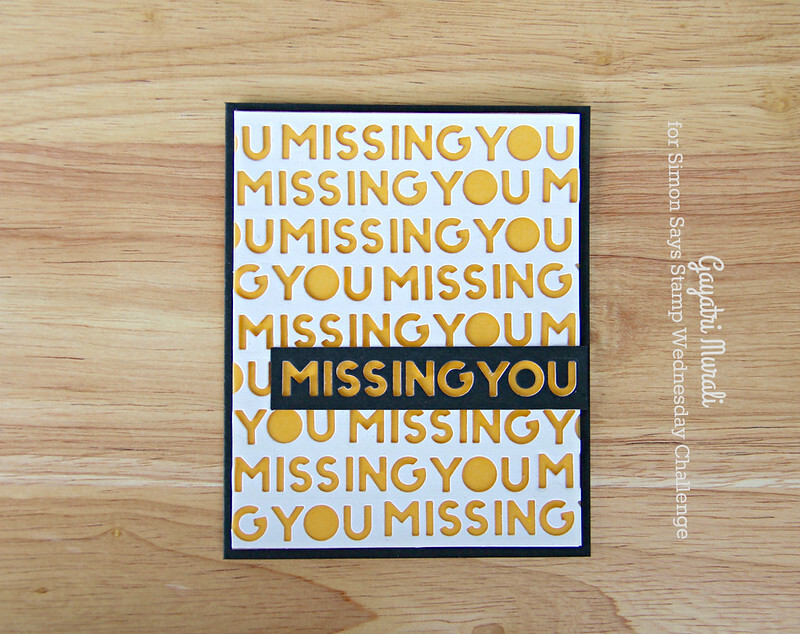 The new product is my new DieCember die Missing You. 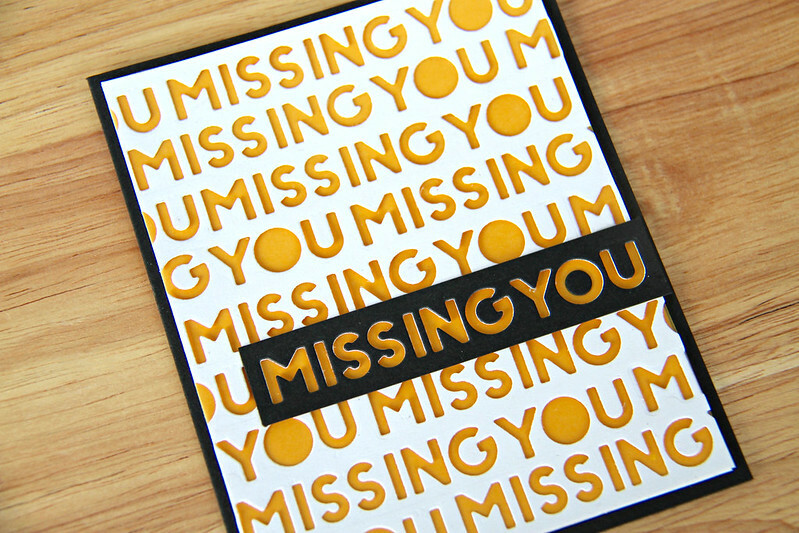 This die comes as a set of three missing you dies in three different fonts. I decided to use the all capital font die as both my background as well as my focal sentiment. I die cut an entire panel of white card stock using the die. This is the time consuming part of making this card. I saved all the positive die cuts for another project and I am using the negative die cut panel. To make the background pop, I had two ideas in mind. The first one is to sponge the card front using some masking and inks. The second is to add a coloured cardstock behind the die cut panel. I went with the second idea as the first idea needed precision and I did not have the patience and the time for it. With the second idea, I changed it a bit by adding coloured vellum behind the die cut panel. This is a yellow vellum from We’re Memory Keepers. I added Ranger Multi Medium Matt on the back of the die cut panel to adhere the yellow vellum. I then adhered this on a white panel again to make this panel sturdy. I adhered this panel on a black card base. The contrast of the white, yellow and black is awesome. The contrast is not very high because there is a lot of white on the die cut panel which neutralises the intensity of the contrast. 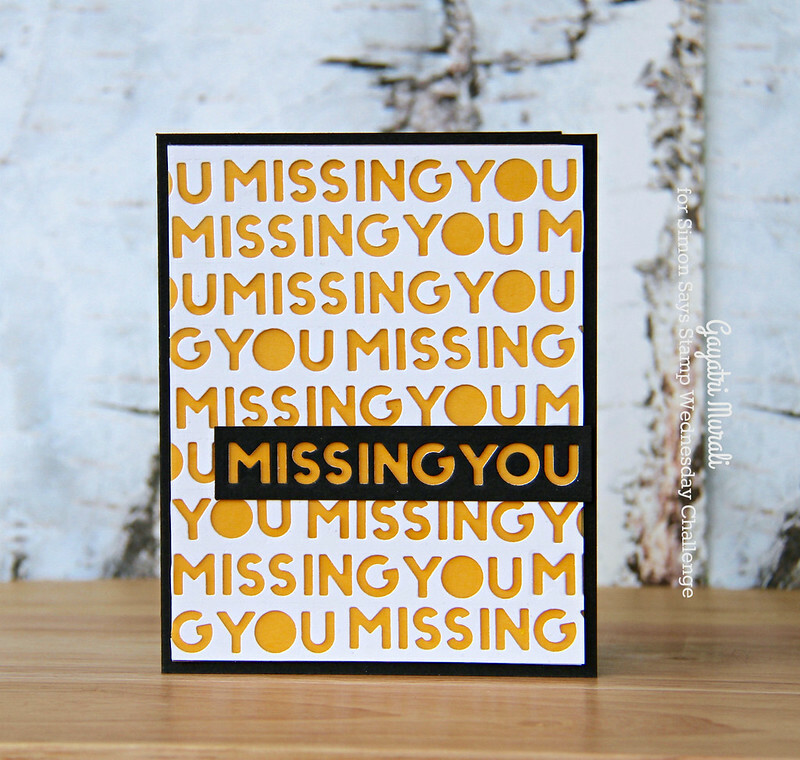 For the focal point, I die cut a strip of black cardstock using the same Missing You die and adhered over one of the background negative die cut. That is the card. No more embellishment as the background of the card itself is very busy. Great design, Gayatri! Happy New Year! Such a clever use of the dies – a great technique (will store this in my “to do” file for a future card! !